Since its founding, the Peace Corps has attracted hundreds of Smith women to its simple mission of spreading peace through volunteerism. As the program celebrates its fiftieth anniversary, members of the class of 1961 share their memories of the Peace Corps’ earliest years and reflect on how their service shaped the rest of their lives. It was more challenge than question. Sensing in his fellow Americans a willingness to contribute to “a greater purpose,” as he put it, Kennedy dared them to devote two years of their lives to promoting world peace and friendship through volunteerism. College students around the country responded to the idea with enthusiasm. Buoyed by their support, Kennedy established the Peace Corps by executive edict on March 1, 1961. It was one of his first orders of business as president, and one of his legacies. In the half century since, more than 200,000 Americans have served as Peace Corps volunteers—and 345 Smith alumnae are among them. Charlotte Kea ’82, deputy director of the Peace Corps Office of Private Sector Initiatives, says Smith alumnae enter Peace Corps service with the experience and background necessary to meet challenges with innovation, creativity, and compassion. “For all Smith alumnae who serve in the Peace Corps, it will be a life-defining opportunity,” she says. This year, the Peace Corps celebrates its fiftieth anniversary, a milestone for the many alumnae who signed up for service during the program’s early years. In honor of the occasion, the Quarterly interviewed six ’61ers who accepted Kennedy’s challenge. Some were motivated by public service, others by wanderlust, but all were brave enough to participate in an experiment that became a social movement. Their stories follow. 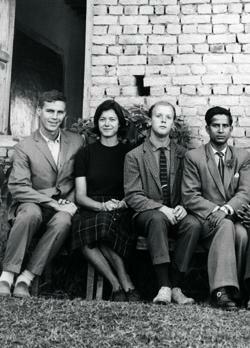 Mimi Smith Ewens ’61 with college staff in Dhankuta, Nepal. Ewens reapplied for volunteer service as soon as she could. This time, she was assigned to Nepal. She resigned her job of ten months, began her training, and became engaged to another Nepal-bound volunteer, Ralph Hambrick. Her mother offered to arrange a quick wedding for the couple before they left, but Ewens scoffed, insisting they would marry after returning home in two years. In Nepal, Ewens was stationed in the capital, Katmandu, teaching English, while Hambrick was sent to the town of Dhankuta—“the boonies.” The combination of culture shock and loneliness proved too much for Ewens, and she broke down and married Hambrick after all. The ceremony, arranged by US-Embassy wives, took place at a marble palace in Katmandu on the day after Christmas, with a traveling minister from North India presiding. Afterward, Ewens joined her new husband in remote Dhankuta, where they moved into a two-story mud house with a thatched roof. The Nepalese women couldn’t understand why Ewens wasn’t getting pregnant, and would poke her stomach. They needn’t have worried. Ewens and Hambrick, who have since divorced, had two sons together, and the first was conceived in Nepal—by accident—toward the end of their stay. Pregnant volunteers had to leave the Peace Corps, so Ewens and her husband kept the news to themselves. They couldn’t imagine failing to finish their service. Reese Heller Berman ’61 in Nigeria. In 1961, Clarice (Reese) Heller Berman ’61 was newly married and living in Cambridge, Massachusetts—Kennedy territory. She and her husband, Stanley, were strong Democrats. They were young. And the challenge to do something for their country was one they wanted to meet. “We felt that dedicating ourselves to bettering an undeveloped place and working toward peace meant a lot,” Berman says. The agency’s lack of readiness resulted in some unique experiences for the couple. First, they were sent to a school where there was no housing for them. That assignment was short-lived. Then they were placed at a men’s teacher-training college in Bichi, a Muslim town in northern Nigeria. They spent about six months there, until the Ministry of Justice learned that Stanley Berman was a trained lawyer, at which point the couple was relocated to the city of Kaduna, where they were given a huge house and where Stanley Berman worked for the Supreme Court. This angered the Ministry of Education, which one month later arranged to have the couple sent back to Bichi, where they served out what remained of their two-year term. Boomeranging around the country didn’t bother Berman (“You just need to be adaptable,” she says), but being involved in two serious automobile accidents did. She was thrown from a bus in one, when the Peace Corps volunteer driving the vehicle swerved to avoid a bird. Her mouth was so full of dust and dirt that her husband thought she had lost all her teeth (she hadn’t). A Nigerian man who witnessed the accident drove the victims to a hospital in his lorry and later returned with the couple’s dog, which had also been on the bus. Berman was touched by the man’s good deed—especially since dogs are eaten as food in parts of Nigeria. She and her fellow Peace Corps volunteers were known as los hijos de Kennedy—“the children of Kennedy.” So, when the president paid a visit to the capital, San Jose, in March 1963, Mathews and her cohorts from Costa Rica I were invited to the US Embassy for the occasion. Mathews didn’t get to meet the president, but did get within fifteen feet of him (“He was right there”). 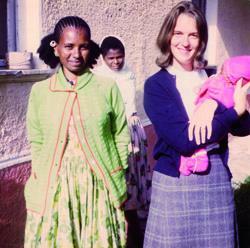 Susan Haller Mangold ’61 with Abrohet, her cook, in Ethiopia. After Susan Haller Mangold ’61 and Ralph Morrison tied the knot in December 1963, the first thing they did was travel around the country with Morrison’s brother, a Quaker pacifist named Norman Morrison, and his wife. They slept in a tent, and this toughened them up for their second major act as a married couple: joining the Peaces Corps. After training at UCLA, where they learned the fundamentals of the Amharic language, Mangold and Morrison departed for the Ethiopian city of Gonder. They were assigned to a secondary school—one of the country’s few. Mangold taught English; Morrison, history. The school was a compound constructed of mud and stucco. Flies were a problem. Their living quarters, in an administrative office building, featured one commode, one bathtub, and erratic plumbing. They had to boil the water before drinking it, and the food was extremely spicy. Today, Mangold loves going to Ethiopian restaurants. “It brings back such memories when your nose starts running and your ears are burning,” she says. Mangold had promised her parents she would write once a week, and she made good using the little blue airmail letters that were ubiquitous at the time. She never did tell them that elsewhere in Ethiopia another Peace Corps volunteer had been attacked and killed—by a crocodile. On November 2, 1965, halfway through Mangold and Morrison’s Peace Corps stint, they heard on the radio about a 31-year-old Vietnam War protester who committed suicide by immolating himself near the Pentagon, leaving a wife and three children. The protester wasn’t named in the report, but Morrison knew it was his brother, Norman. In Grant’s case, that was teaching at a girls’ Catholic boarding school called Cornelia Connelly College in the southeastern Nigerian city of Uyo. The school was competitive and had high academic standards. In fact, the students in Grant’s British-history class used the same textbook she had used at Smith. “I was about a day ahead of the class in preparation,” she says. Grant never saw the nuns except during school hours; they lived an isolated life. As a Protestant in a Catholic setting—during Vatican II, no less—and the only Peace Corps volunteer at the school, Grant was also at risk of isolation, but she made a habit of hopping on her French Mobylette moped and traveling twenty minutes to the center of town, where she got together with a Peace Corps friend, went out to eat, and danced to highlife music. It also didn’t hurt that the nuns arranged for young girls from local villages to help the teachers with their cooking, ironing, and other chores. True, Grant says, she was “not roughing it the way you would have imagined Peace Corps volunteers roughing it,” but she became very fond of the girls who worked for her, and even paid their school fees during her Peace Corps stint and for years to come. The European teachers joked that Americans were too lenient, spoiling their “servants,” but the village girls were Grant’s closest friends. “I learned more about authentic African life from those girls than I would have any other way,” she says. Nancy Keebler Bissell ’61 comes from a family of conservative Republicans. She made a political statement when she voted for Kennedy in 1960 and another when she joined the Peace Corps three years later with her then-husband, Roger Wolf. “We wanted to expand ourselves, expand our world,” Bissell says. When the SAQ sent an e-mail request to members of class years 1961, 1962, and 1963 for memories of the Peace Corps’ formative years, we thought we’d hear from a small handful of alumnae. We were surprised when dozens of former Peace Corps volunteers wrote in to describe memories and ideals that remain vivid. The summer issue of the magazine included several recollections, and here are a few more. In 1990-1991 my husband and I interviewed with the Peace Corps (hardly the original Peace Corps, but very much the newer Peace Corps where the average age is the mid-30s, but the volunteers are either in the early 20s or over 50). After over a year of interviewing and planning, our assignment came through for Vanuatu in the Southwest Pacific and we were delighted. Then they mentioned, three weeks before leaving, that we had to be married before we left. I was danged if we would get married because the government said we had to. The upshot is that Jim went as a volunteer, and I, with Peace Corps permission, accompanied him as his permanent guest. I made arrangements to work for an international family planning agency active in the Pacific, but the funding for my job was pocketed by the minister of finance the day I showed up. I hired a teacher to learn the local pidgin, Bislama, enrolled at the University of the South Pacific to take their required introductory course for new students on South Pacific cultures and history, and hopped aboard private sailing yachts as pilot to take them around the outer islands of Vanuatu, for which there were no charts. In time I also arranged a great job funded by the Canadian government to do disaster relief work after cyclones. Jim and I agree that our four years in Vanuatu were the best years of our life. To be token whites in a black culture, where we had very little relevance or meaning, and to live in a culture that was successfully functioning but that had not a single value shared by western whites was truly amazing, and eye opening. Their concepts of love, marriage, chastity, celibacy, children, family responsibility and duties, money, time, “god(s),” ownership, sharing, and power were vastly different. Every day was fascinating—the longer we were there, the more we realized we would never understand why things happened, or didn’t, and every day was a learning experience. Best of all was realizing that there are so many ways to live, and of handling the events of daily life, and all of them are valid. It was wonderful to spend four years with three T-shirts, two skirts, one dress, two pairs of shorts, and own four plates, four knives, forks and spoons, and two cooking pots. Coming back we were overwhelmed by the staggering amount of consumer goods available, none of which we wanted. The idea that people had faxes in their cars and cell phones to make themselves constantly available stunned us, and seemed both unnecessary and way too intrusive. It took well over a year to begin to feel at home. Of course, eventually we rejoined the hoopla, to an extent, but we have never lost our wonder and appreciation of cultural diversity. Would that every westerner, and every US government bureaucrat, had that experience. We also grew to view foreign-aid programs with enormous skepticism. But that is a whole other subject. 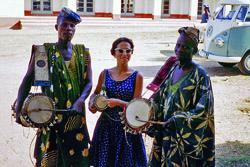 We loved our Peace Corps experience and would recommend it in a heartbeat. It creates firm multi-cultural friendships, and makes for wiser US voters. I attended a couple of Peace Corps recruiting meetings during my last two years at Smith but had not decided whether or not to apply when I graduated in 1963. However, a summer trip in Europe and the assassination of President Kennedy affected me greatly and in late ’63, I sent in my application. The following summer, I trained in Portland, Oregon, and was sent to Turkey as a TEFL [Teaching English as a Foreign Language] teacher, the fourth PC project in the country. The first year, I taught middle and high-school English in the large southeastern city of Gaziantep; the second year, I married another PC volunteer in Istanbul and joined him in his PC site, a small provincial capital known as Tunceli, where we taught mainly Kurdish kids. I found the teaching and living experience to have been one of the most challenging and rewarding highlights of my life. We returned to the States in 1966. In 1968, after grad school at the University of Pennsylvania and the birth of our first child, we again went to Turkey where my husband served on the Peace Corps staff for another two years. Together we visited volunteers in their sites and I spent some time as the administrator of the embassy’s language school. Both of us continued our careers in education when we returned to the states in 1970. Forty-plus years later, our Turkish experience still resonates in our lives. We have an active, returned-Peace-Corps organization where we connect with our old Peace Corps friends and keep current on happenings in Turkey. Together we support a number of on-going projects in Turkey. We maintain our contacts with some Turkish friends and students and go back to Turkey occasionally to savor Turkish hospitality, its spectacular scenery, its historical past, and its great food. For us, it’s our second home. I served with the Peace Corps when it was still seen (by volunteers, at least) as a force for change. My then-husband and I worked in community development in a small town in Cundinamarca, about three hours down the mountain from Bogota, in coffee country. We were part of a regional team—an experiment that linked a couple of architects, an engineer, two or three agronomists, a literacy teacher, and a bunch of community organizers into one unit, with most of the members living in villages around a larger town, but all sharing skills. It was an absolutely pivotal experience for me. I did no harm, I think, and may even have done some good, but the big benefits were mine.